The retina is a thin sheet of nerve tissue in the back of the eye where light rays are focused and transmitted to the brain. Tiny blood vessels supply the retina with oxygen and other nutrients. Arteries deliver the blood, and the retinal veins carry it out. Sometimes one of these arteries hardens or swells and presses on a nearby vein. The vein can then become blocked, or occluded, making it difficult for blood to leave the eye. 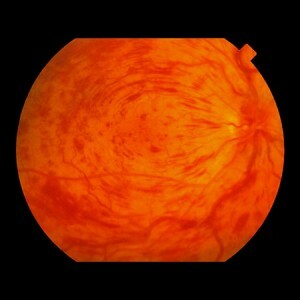 This is called a retinal vein occlusion (RVO). It is also known as venous stasis retinopathy. The blocked circulation can lead to swelling, bleeding, growth of abnormal blood vessels, and partial or total vision loss. Retinal vein occlusions are the second most common cause of blood vessel-related vision loss (the first is diabetic retinopathy). The condition occurs most often in men and women over the age of 50, particularly those in their 60s and 70s. Treatment depends on the severity of the blockage and the location of the blocked vein. If the largest vein leaving the eye is affected, the condition is known as a central retinal vein occlusion, or CRVO. It is important to have routine eye exams to detect any developing problems early. You can keep tabs on your vision between appointments by closing one eye at a time. There is no cure for retinal vein occlusions. Emphasis is placed on risk management, treatment of symptoms and prevention of further vision loss. It is critical to control high blood pressure, high cholesterol, diabetes and other health conditions that increase the risk of vascular hardening, narrowing and blood clotting. Macular swelling may be treated with intravitreal injections of medication (anti-VEGF or steroid). Neovascularization typically appears six months to a year after the occlusion. It can cause bleeding, glaucoma, retinal detachment and reduced vision in its advanced stages, so laser photocoagulation treatment is recommended to slow or stop vessel growth. If bleeding continues, a vitrectomy may be performed to remove the blood and vitreous gel. Vitrectomy can also relieve tension from a retinal detachment.